I am posting this item because I thought that it looks about as clean as any tank fan that I have. The only connection I have to the fan is that the seller had sent me a message from my early fans.com blog several weeks ago asking about the fan and I tried to help. 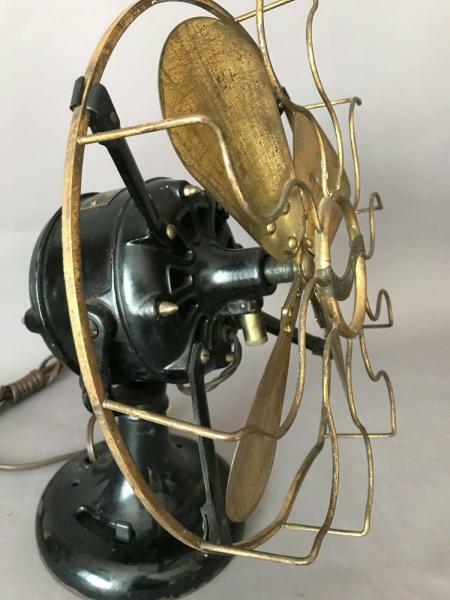 You will have to look at the photos and message the seller if you need to know more but give the fan a look. It is a 1910-11 model the best I can tell with excellent Japan finish. The seller says they have shipped a few fans before but not this heavy. I would be happy to help them with packing details if you ask them to "email Steve". Steven do you know if the cage is correct for the fan? The cage is 2 1/2" deep and has the curve at the bottom. Also is there supposed to be a micro date on the bottom left of ID tag for this year? Looks like its a bit cobbled together Michael, the strut to motor screws are wrong too. It's already past the price point to put it back to me, but then what do I know? You guys are on the ball. My quick look did not catch the wrong strut screws or the stamped steel cage with the reverse curve. Screws should be fillister head on the struts. It would be later Westy tanks with the 1910 patent dates on the tags that have a micro date such as below. Before that I don't think the tanks had a micro date. So this ebay fan's date is in question and is probably earlier by a year or a few than my estimate. Page processed in 0.1562 seconds (19% database + 81% PHP). 27 queries executed.